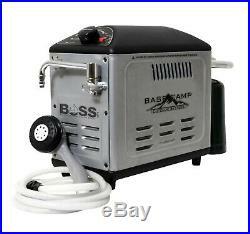 Heater BaseCamp BOSS-XW18 Battery Operated Shower System. Brand New in Original Packaging. 17,000 BTU per hour. Electronic pulse ignition button. Certified in US and Canada. 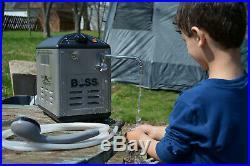 Heater BaseCamp BOSS-XW18 Battery Operated Hot Water Generator lets you bring the comfort of a hot shower to the beach, campsite, or anywhere else your adventures take you. The battery charges via AC adapter so you can get power from a standard wall outlet or from your vehicle. Once you’ve placed the generator pump in a bucket of water, you can select your preferred water temperature and enjoy a luxurious shower with a press of the electronic pulse ignition button. There is also a faucet attachment for washing your hands after a day of hiking and exploring. Heater BOSS XW18 includes scald protection so your water won’t run too hot, and the cordless, battery operated design means you can get hot water in the most remote locations. What’s in the Box. BTU per Hour: 17,000. Carry Bag Included: Yes. DC Charge: 8-10 Hours AC/ 4-6 Hours DC. Digital Temp Read-Out: No. Flow Rate (Gal/Min): Minimum Flow. 6 G/min to Maximum. Tank Capacity (Gal): No. Temperature Rise (F): No. Use: Camping, RV, Fishing, Hunt Camps, Tailgating, Patio, Beach, Poolside, Pet Care, Bathing, Outdoor Shower. Battery Type: Sealed Lead Acid. F There are product categories which are not returnable due to hygienic or sanitary as required by manufacturers. In an event where there is an error regarding a price error or description, we will notify you ASAP. Items removed from their’blister-pack’ display packaging are non-refundable. The item “Mr. Heater Outdoor Shower BOSS-XW18 Basecamp Battery Operated Shower System” is in sale since Thursday, August 9, 2018. This item is in the category “Sporting Goods\Outdoor Sports\Camping & Hiking\Camping Hygiene & Sanitation\Portable Showers & Accessories”. The seller is “asavings” and is located in Brooklyn, New York. This item can be shipped to United States.